CCP has announced EVE Online: Quantum Rise, another free expansion for its space-based MMOG EVE Online that will introduce pilot medals, a new certificate system and changes to industrial ships, "the backbone of EVE's vibrant economy." EVE Online: Quantum Rise also features behind-the-scenes upgrades to server hardware and improvements in server-client communications, bringing to life the possibility of multi-fleet battles featuring thousands of ships in simultaneous combat and allowing CCP to implement even more improvements in the future as they work toward creating the most massive player vs. player experience possible. Quantum Rise will be the long-running game's ninth free expansion. 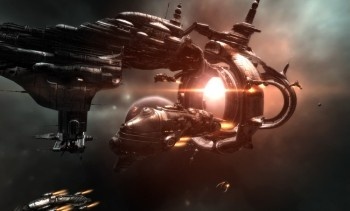 "We are very proud to be delivering this expansion, both in terms of features and the sheer performance increases made possible by deep refactoring of selected portions of our network and server code, complimented with the finest hardware we could find," said EVE Online Senior Producer Torfi Frans Ã“lafsson. "I can't imagine a better game where you can engage hundreds of people simultaneously in highly immersive tactical combat or simply sit back and make millions off of the conflict via research, manufacturing or logistics. You choose your destiny; that's the beauty of it." The EVE Online: Quantum Rise expansion will include other game tweaks and enhancements as well as further additions to the major graphics upgrade that was implemented as part of the EVE Online: Trinity expansion. Further details will be released in the weeks leading up to launch, set to take place this winter, at eveonline.com.